An AU where Allura and Coran are the last surviors from their tribe, who has a strong bond with lions. Okay, everyone just looks so amazing! Like, you can easily tell who the lions are without their colors, an they're all so wonderful! And I love what you did to Allura's hair, she's fantastic. I have to love this for that way cool design of Allura's. That is a seriously cool look. 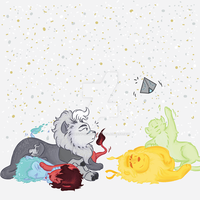 And I love how you turned the Voltron Paladins into ACTUAL lions; they look really good.